With two billion monthly users, Facebook is by far the most popular social media platform. However, you’re going to need an excellent Facebook marketing strategy if you want your business to stand out among the 50 million businesses on Facebook! Facebook ads are the cornerstone of many small business’s marketing strategies, but you need to pay attention to the content on your page in addition to your ads. We’re here to provide you with 7-step Facebook marketing strategy sure to help your business succeed! The very first step in your Facebook marketing strategy should be to set goals. What results are you looking to achieve from your Facebook marketing strategy? Are you trying to gain brand awareness, increase website traffic, gain leads? Once you have determined your goals, you can adjust your Facebook marketing strategy accordingly. There is no one-size-fits-all Facebook marketing strategy. Setting goals is how you make sure your strategy is catered to your specific needs. So where do you start? When setting goals, it’s a great idea to use the SMART strategy. That is, setting goals that are specific, measurable, attainable, relevant, and timely. For example, instead of stating that your goal is increased brand awareness, your goal could be to gain 1,000 followers in three months. This is a SMART goal because it is specific, can easily be tracked and measured, it’s realistic, and it has a time component. If you’re looking to increase leads and sales, your goal could be to have 30 leads and a cost per conversion of less than $10 by the end of the month. Setting SMART goals can help you determine if your Facebook marketing strategy is working. Facebook marketing is useless if you aren’t reaching the right people. That’s why getting the right target audience is so important! Whether your target audience consists of grandmas, gamers, or graphic designers, odds are, they’re on Facebook. You just have to know how to find them. So where do you start? If you have a basic idea of who your target audience is, you can start building an audience in Facebook Ads Manager. You can build a custom audience by clicking on the “Audience” section pictured below. Next, click the blue “create audience” button on the left-hand side of the screen and select “custom audience” on the dropdown list. When you create a custom audience, Facebook will first ask how you want to create your audience with a list of options. The option you choose will depend on the amount of information you already have available on your target audience. The first option on the list is to upload a customer file. If you have a list of information on previous customers including names, phone numbers, and/or email addresses, Facebook can use that information to generate what is referred to as a lookalike audience. A lookalike audience is an audience composed of Facebook users similar to your current customers or clients. This can be a great start and can be narrowed later on if the audience ends up being too large or you only want to target certain demographics. Some other custom audience options include targeting people who have visited your website, people who have previously engaged with your Facebook or Instagram page, and more. These options are great if you already have a lot of engagement and want to turn your followers into customers or if you have a lot of website traffic and wish to retarget people who visited your site without making a purchase. We will dive deeper into retargeting shortly. If you don’t have a customer list, as many startups do not, you can create a custom audience from scratch. To do this, you’ll want to select Saved Audience instead from the same drop down menu where you selected Custom Audience. You can now fill in the targeting information you desire and click “create audience” at the bottom of the window. Once the audience has been saved, you can use that custom audience in future ad sets and tweak it as needed. While creating your custom audience, pay close attention to the meter on the upper right-hand side that shows you the audience size. Ideally, your audience should fall into the green range on the meter. The red indicates your audience is too specific and the yellow indicates your audience is too broad. Reaching as many people as possible may sound great, but you should always refine your audience to just the most qualified people. A big pond doesn’t necessarily mean you’ll catch bigger fish. In fact, it may make it more difficult to find the right fish. Analogies aside, you can narrow your audience if you think it may be too big. You can do so by clicking the “Narrow Audience” button as pictured below. As you can see in the above image, this fairly large audience includes 2,000,000 people. It includes people in the U.S. who are small business owners OR are interested in social media marketing. If we click the “Narrow Audience” button, we can remove small business owners from the first section and add it to the new section. This makes it so the audience consists only of small business owners who are also interested in social media marketing. Narrowing the audience this way will lower it to 65,000 people. On the other hand, if your audience is too small, you risk the same people seeing your ads over and over again without reaching new people. As you can see in the chart below, Facebook tracks both “reach” and “impressions”. Reach is the number of unique users who have seen your ads while impressions are the number of times your ads have been seen in total. If your impressions are higher than your reach (as they often are when your ads have been running for a while), that means some of your audience members have seen your ads more than once. If your number of impressions is way higher than your reach, it may be a sign that either your audience is too small, or just that you’ve exhausted your audience and it’s time to work on a new one or refresh your ads. What if you aren’t sure who your target audience is already? Don’t worry! Facebook has tools for that, too. Facebook Audience Insights is a fantastic tool to conduct research on the demographics of your competitors’ followers. This will give you a starting point from which you can create your own unique target audience. For example, let’s say you own a pizzeria. You can type in the names of popular pizza restaurants into the “interests” section of Audience Insights to learn which types of people might enjoy your restaurant. Once you’ve obtained the demographic information you need from Facebook Audience Insights, you can use it to build your own custom audience. Earlier in this section, we mentioned the term “retargeting.” Retargeting is when you target a set of ads towards people who have visited your website without making a purchase. A retargeting audience tends to be smaller than other audiences, but more effective since 100% of the audience is already familiar with your brand and has expressed some interest in it already. In the marketing world, this is called a warm audience. On average, only 2% of online shoppers make a purchase on their first visit to an online store. Retargeting is how you focus on turning the other 98% into customers! The next step in your Facebook marketing strategy is to plan your monthly budget. As the old saying goes: you have to spend money to make money. This has never been truer when it comes to your Facebook marketing strategy. Facebook is a very money-motivated platform. As long as you are willing to put some money behind your posts and ads, Facebook can put your page in front of people who may have otherwise never heard of it! You’ll want to look back to the initial goals you set to decide which features to budget for. A typical Facebook marketing budget would include page like ads, conversion and/or lead generation ads, boosted posts, and content creation. Page like ads are the ads that grow your following on Facebook. Unfortunately, organic growth is a little more difficult on Facebook than it is on other platforms like Instagram and Twitter. To grow your Facebook followers, you’ll have to put some money behind it. Follower growth may seem like a vanity metric, but having a large following can be beneficial to your company and can actually lead to increased profits in the long run. Think about it: if you were going to take your car in for repairs and one auto repair company had 5,000 Facebook likes and the other only had 150, which one would you trust? That’s right, the one with more followers! Follower growth leads to increased brand awareness and reputability, making your company appear more trustworthy to potential consumers. The more money you put behind your page like ads, the more followers you can expect to receive. Conversion ads are the ads you will use to generate sales and lead ads are the ads you will use to generate leads who can be turned into customers. These ads may command a larger portion of your budget than page like ads since they will more directly impact your sales. Content is technically free to create on Facebook, but it will cost you money if you wish to hire a marketing company or an employee to create posts for your business. That makes the content portion of your budget optional but highly recommended. Great content means nothing if nobody sees it. Unfortunately, thanks to Facebook’s current algorithm, only a very small percentage of your followers will actually see your posts. In some cases, less than 2% of your followers can be reached organically. This is where boosting posts comes in. You can use a small amount of your budget to boost posts so more of your followers will see them. You can also boost posts to audiences beyond your followers. So now you know what your budget should consist of, but how much should you spend on each portion? There is no clear answer to that question since every business has different goals and different financial means. The best way to figure out if your budget is appropriate is to test it out for a month then determine your ROI. If it’s positive, you’re on the right track. If it’s negative, you may want to make some adjustments. Tina owns a restaurant. Her goal is to establish brand recognition for her restaurant by posting five times a week and gaining 1,000 followers in six months. Tina does not have the time or knowledge to do it herself, so she decides to delegate her Facebook marketing strategy to a digital marketing company. Her total monthly budget is $900 with $500 going to the digital marketing company she has hired, $300 going to page like ads, and $100 going to boosted posts so her followers will see more of her posts. Now that you have your goals and target audience in mind and your budget planned, it’s time to begin drafting content to post on your Facebook page. We recommend planning posts about a month in advance and maintaining a regular posting schedule such as five posts per week. This way you can diversify the topics you post about, plan for any upcoming holidays or events, and keep your posting consistent. Also, planning content ahead allows you to ensure you’re only publishing high-quality content. The last thing you want is to hastily publish something on a whim! Many marketing companies have access to scheduling software that allows you to schedule your content ahead of time so you won’t have to worry about posting it manually. It’s a good idea to include an image, video, or gif with every single post you make. On average, Facebook posts with images receive more than twice the engagement those without images do. That being said, posts with videos receive even more organic engagement than posts with still images! People’s eyes are naturally drawn to images with faces in them. Bright, high-resolution images are vital! Stay away from cheesy stock photos. Only 15% of Facebook videos are watched with the sound on. Make sure your video conveys the right message even without the use of sound. One underutilized copywriting tactic is to include emoticons. Using emoticons increases comments by an average of 33% and likes by about 57%! Of course, you should use your best discretion with emoticons since they may come off as strange or insincere on a serious post. One last thing to keep in mind is to diversify the types of posts you put out. We recommend keeping promotional posts down to about one third of your content. If your followers want to learn more about your company, they can click onto your website. Utilize your content differently by establishing your brand as a leader in the field and encouraging interaction from consumers. A great way to do this is by asking questions in your content. You can ask your followers to respond in the comments, encouraging interaction with your account, as well as interaction between your followers. Another tactic to encourage engagement is to ask users to tag their friends or family in a post. One way to increase engagement rapidly is by running a contest or giveaway. If you are able to give away some product or services for free, you can encourage users to share, comment on, or tag their friends on a post about the giveaway. This is a great technique for increasing follower growth as well! Generally speaking, the more you post, the better. Not all your followers will see every single one of your posts. However, no one wants to be bombarded by constant posts from a brand, so we recommend posting between 3-10 times per week on Facebook. Our last tip when it comes to crafting the perfect content for your Facebook account is to keep your tone consistent. Do you want your brand to be witty? Heartfelt? Serious and informative? Regardless of the route you take, stick with it for a cohesive feel to your Facebook content. It helps to have one person write all the copy rather than switching off between employees. Many of the same strategies behind creating engaging Facebook content can be applied to creating quality Facebook ads. You will want to keep the same tips in mind about using bright, clear images with faces in them and videos that convey meaning without the need for sound. However, Facebook ads have a few more rules when it comes to images. Image sizes for a Facebook conversion ad and a page like ad are 1200 x 628 pixels and 1200 x 444 pixels respectively. Also, these images cannot contain more than 20% text. This can make finding/creating images a little tricky. You can cover your bases by hiring a good marketing company or graphic designer. When it comes to ad copy, your call to action will depend on your ad objective. When possible, we recommend sticking with the same three-sentence strategy used to write your Facebook posts. However, the character limit for Facebook page like ads is pretty slim and may not always allow for this. Regardless of the type of ad you’re creating, keep your target audience in mind and make sure your call to action is clearly defined in the last sentence. Some examples are “like our page for discounts and updates” for a page like ad, “shop now,” for a conversion ad, and “download our app for free today!” for an app download ad. Going back to step number one of this Facebook marketing strategy, the types of ads you use will depend on your goals. If you want to increase visibility and brand awareness, you’ll place more importance in page like ads and boosted posts. If you’re trying to convert followers into customers, you’ll want to focus on a lead generation or conversion campaign. There are also specific campaigns for objectives like getting app installs, generating website traffic, and encouraging event responses. Previously, in the Audiences section, we mentioned retargeting. Writing copy for retargeting ads is a little different since your audience is already familiar with your brand. It’s a good idea to directly address that you already know they are interested in a particular product within your ad copy. You can also offer an extra incentive like a promo code discount. Offering a discount only to those who have already expressed some interest in your products is a great way to turn that warm audience into real customers! 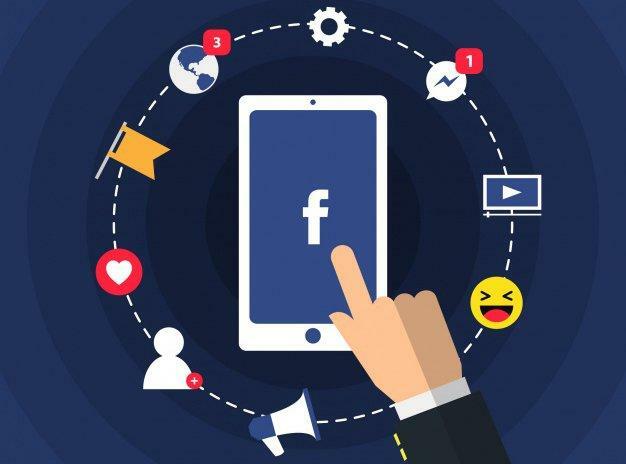 Once you have your posts planned and your ads created with an efficient budget, the next step of our Facebook marketing strategy is to begin monitoring your Facebook account. We recommend monitoring your account every day to respond to comments and messages and to make sure all your scheduled content is posting properly. It’s no secret that people love interacting with brands. In fact, 71% of consumers who have had positive social media interaction with a brand are likely to recommend it to others! Facebook users may feel discouraged to engage with your account if they see comments going unanswered and a poor message response rate. You should respond to all comments in some capacity, even just by “liking” them to acknowledge the commenter. Spam comments can be hidden along with angry, rude, or abrasive comments. However, we don’t always recommend hiding negative comments. It is better to respond to such comments and potentially appease dissatisfied customers or clear the air about misunderstandings rather than simply removing the comments. This way other people who may have similar opinions can learn from your responses, and you don’t risk angering the disgruntled customer even more by ignoring them. Facebook comments from angry customers can prove to be great customer service opportunities if taken care of correctly! When it comes to positive comments or reviews, always be sure to express your gratitude. This can increase the likelihood of someone becoming a repeat customer or recommending your company to their friends. Another benefit to daily monitoring is catching errors quickly. Typos happen. Even with spell check and proofreading, it is possible for grammatical errors to slip through the cracks. Monitoring your posts after they have been published can help you catch mistakes before too many people see them. One last reason to monitor your Facebook every single day is to improve your response rate! Facebook tracks how quickly you respond to messages and publicizes your response rate on your page. It may look unappealing to potential customers if you have a low response rate. Be sure to answer every message your company receives as quickly as you can. If you receive a spam message, click the “mark as spam” button so Facebook won’t register it as an ignored message. Now that your Facebook marketing strategy has gone into effect, you have to continually optimize everything. The key to an effective Facebook marketing strategy is A/B split testing. This is when you compare small variations of a strategy to figure out which aspects work the best. Through your testing, you can track which days and times are best for you to post, what types of content resonate best with your audience, which ads are most effective, and more. Even after you have pinpointed the best days and times to post, you should still continue to monitor your metrics as the data may change depending on the time of year! Facebook provides plenty of useful metrics for A/B split testing to help you easily optimize your Facebook marketing strategy. To access Facebook insights, simply click onto your Facebook page and click “Insights” on the top bar, right next to “Notifications.” Facebook Ads Manager will provide you with statistics on cost per click, click-through rate, total ad reach, and more! You may want to consider using a third-party software for a more in-depth analysis of your ads. Many social media marketing companies can provide you with unique metrics and professional analyses. 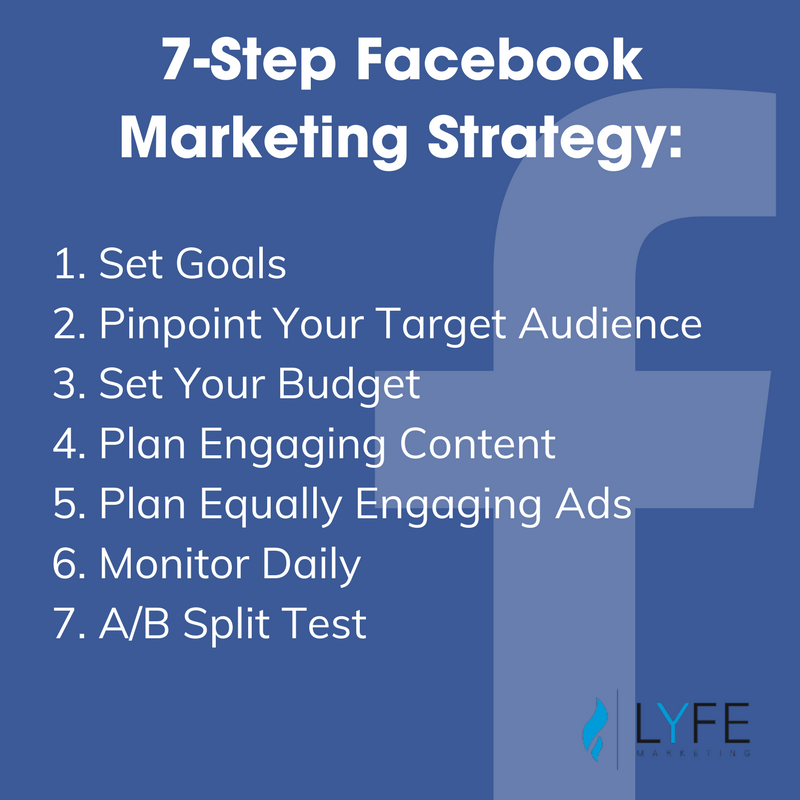 Consider enlisting the help of LYFE Marketing as you embark on your Facebook marketing strategy. You can also check out case studies on how we have helped other small businesses grow with a Facebook marketing strategy tailored to them. A social media management company with a concentration on lead generation and sales. We position our clients for success through social media management services, social media advertising services, website design, and content marketing. Get a FREE Digital Marketing eBook.